I have children, so I sometimes (a lot of times) watch movies that I would not normally watch if I did not have kids. Well, I am pretty happy about that because it gives me an excuse to watch certain movies (lol) and I get exposed to ones that I would not normally even consider. 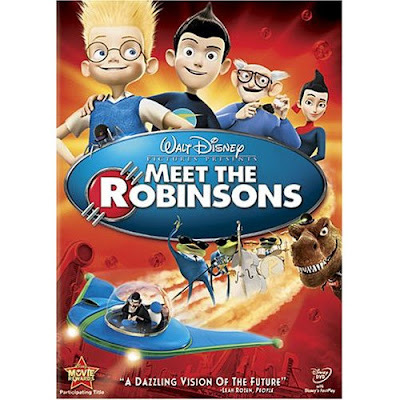 Meet the Robinsons is definitely one of the movies that I would have never given the time of day; however, I was pleasantly surprised when I got the movie for my son. Now available on DVD, it is a story about an orphaned boy who makes a great invention that ultimately sets the course for the future. Unfortunately, things do not work out the way he would like (don't I know about that) and he loses confidence in himself before he can complete the invention. In comes the future and the adventure starts. This was such a good children's movie that I found myself taken in by it. Meet the Robinsons is a great family movie to watch because it entertains everyone. Even my two-year old daughter was into it (she just would not go to bed). It is a motivational message hidden in animation. "Keep moving forward!" I definitely recommend this DVD as a keeper.